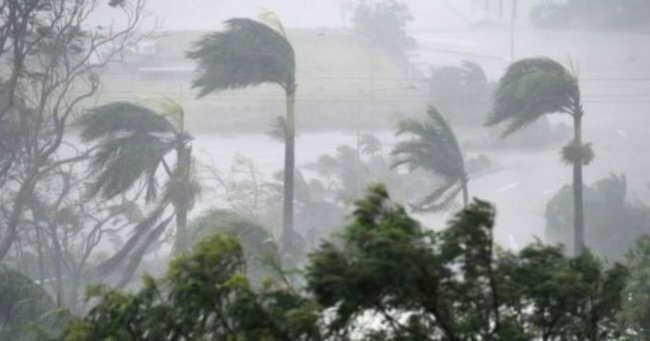 Cyclone Debbie residents share stories: Torrential rain and wind. Panicked residents in areas affected by Cyclone Debbie have relayed their experiences to the ABC as torrential rain and wind gusts pummel the region. Proserpine local Sue said her house sustained heavy damage after being hit by debris from her neighbour’s roof. “The next-door neighbour’s roof has been flying off for hours and it’s smashed into our side windows — we’ve got three broken windows now so the rooms are totalled,” she told ABC Tropical North in Mackay. “We’ve got water coming down the hallway from those rooms — the doors are shaking, the interior doors to those rooms — I can hear the aluminium venetian blinds that I should have pulled up, shaking in the wind and we’ve got venetian drapes flying out the window from the other room. Sue said the entire house was shaking and she could hear things crashing in the bedrooms. She said she was huddling with her husband in their bathroom. “I’m in the safest place, but that doesn’t mean I’m safe — I’m in a very small bathroom and you can just hear these other crashing noises and the doors shaking. “I think the house would’ve been all right if it wasn’t for the neighbour’s roof falling off. I just can’t believe how long it’s taking, so it’s really horrible. Sue said she had lived through many cyclones growing up in the region, but this was the scariest experience she could recall. “I went through Ada when I was in my very early teens and it was a really bad one, but we were in a weatherboard, highset house that was very well built. We ended up with a lot of water damage because the cyclone forced our casements open. “But to listen to this — because of the damage to our house, it’s horrifying. Thousands of residents across the Whitsunday region have lost power after the area was hit with wind gusts of up to 263 kilometres an hour. Long-time local Gail Harvey said conditions there were worsening. “Horrendous — in 30 years I’ve been through a lot of cyclones on Hamilton Island. One year we had five cyclones — one after the other — and in recent years we’ve had some big ones but this one is just staying around and not moving,” she said. Eva Martinez has been stranded on Hamilton Island for the past 48 hours and said the wind had been unbearable. “The wind was crazy at that time, we can’t see anything, and it’s moving boom, boom very fast,” she said. Further south, Corinne Dibnah was evacuated from the Bowen Golf Club and said she had to take her dogs to a local motel. ABC reporter Josh Bavas is in a motel room in Bowen and said trees were breaking and there was vegetation and debris flying through the streets. “A street sign has come away from the concrete out the front of this motel and the decision’s been made that we’ll stay inside from now on,” Bavas said. “It’s a besser-block motel — single storey and it’s shuddering with the wind gusts. The roof in parts is making a clanging noise, the door’s rattling — it’s like someone’s at the door trying to get in. “There are four-wheel drives parked behind me here and I have been watching them wobbling with those wind gusts. “Strangely, I thought [the sky] might be darker than this. It is still like an overcast day, I guess, but it is a white-out. He said low-lying areas of the main part of Bowen were being inundated.